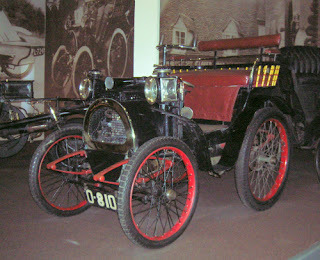 A few more cars from the late 1800s from my photo collection, all from the National Motor Museum at Beaulieu. First up is this 1897 Daimler Grafton Phaeton. If you’re thinking there’s a connection with Mercedes-Benz, you’d be correct. An English company (the Daimler Company) formed in 1896 had licensed the Daimler patents and was building cars in Coventry by 1897. You can find more details on the car at the Jaguar Heritage Trust website HERE. While, you’re there, check out the other cars in their collection. No, despite the Coventry connection, Jaguar’s history doesn’t go back that far. This 1898 Benz Velo is a German car. The Benz Velo or Velocipede first appeared in 1894, as the successor to Karl Benz’s Patent Motorwagen (Wikipedia). 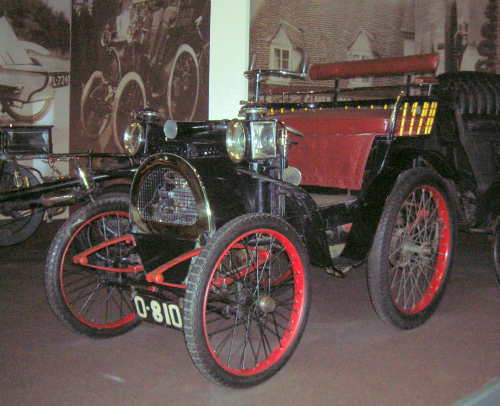 It’s considered “the world’s first large-scale production car” with around 1,200 produced between 1894 and 1902. More details on the Benz Velo can be found on THIS Mercedes-Benz webpage. I can’t find any information online on this 1898 Cannstatt Daimler other than THIS page by the National Motor Museum, so I’ll have to rely on my photo of the plaque beside it at the National Motor Museum. It was built in Bad Canstatt (hence the name) by the Daimlen Motoren Gesselschaft, a German company founded by Gottleib Daimler and Willhelm Maybach. It wasn’t just Canadians, Brits and Germans jumping on the motor car bandwagon. 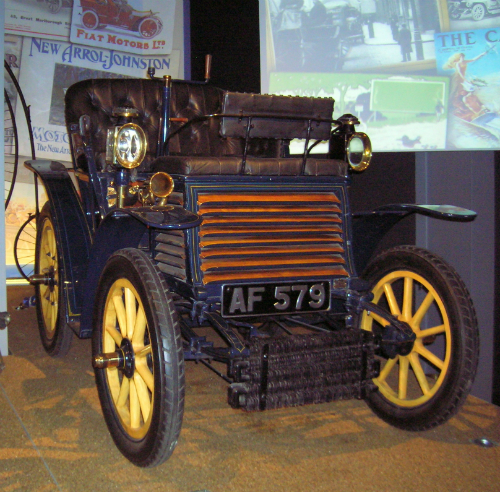 Both Fiat and Renault also started building cars in 1899. Here’s an example of each. Every year, as New Year’s approaches, I tell myself I’m going to write a blog post on the cars from the model year 25 years ago, which are about to become classics by most car show rules. And every year I’m so busy trying to catch up on the paying work (oh, the joys of freelancing) after taking time off for Christmas, that it doesn’t happen. So I decided, why wait for New Year’s? Why not start now with the oldest cars in my photo collection and go from there. But before I get started, did you know that there were people building cars in Canada in the 1800s? I certainly hadn’t, but that’s what I discovered during my research for this article. Check out this PAGE from the Canada Science and Technology Museum, where you can find out about Seth Taylor’s 1867 steam buggy, an 1893 electric vehicle designed by William Still and Frederick B. Featherstonehaugh and built in Toronto, and an 1896 gasoline-powered automobile built by George Foote Foss of Sherbrooke, Quebec. 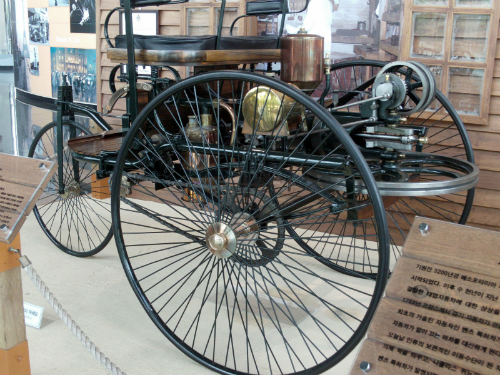 Here’s a picture of a replica 1885 Benz Patent Motorwagen from the Samsung Transportation Museum in Korea. While this is often called the first car, there were working steam-powered vehicles back in the 1700s. There were even steam-powered buses. Steam cars became so popular in the 1800s that legislation was passed to regulate them in the UK (the 1865 Locomotive Act) so that they had to be preceded with someone on foot waving a red flag. The annual London to Brighton Veteran Car Run is based on the celebration of the repeal of that law in 1896. 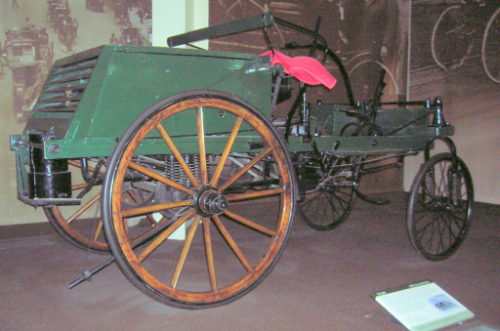 The 1885 Benz, however, was the first production car with an internal combustion engine. Here’s the 1895 Knight from the National Motor Museum at Beaulieu, England. 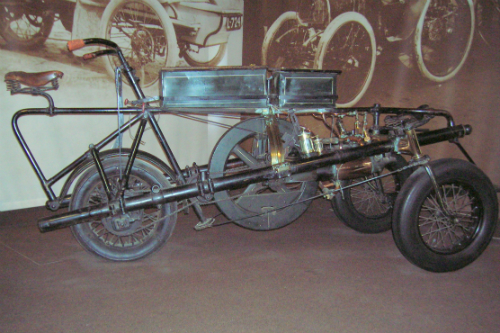 It was the first British gas-powered vehicle to hold two people, designed by John Henry Knight. Originally a three-wheeled vehicle, it was reconfigured the following year with four wheels. According to Wikipedia, Knight built it to draw attention to the rules against motor cars at the time. 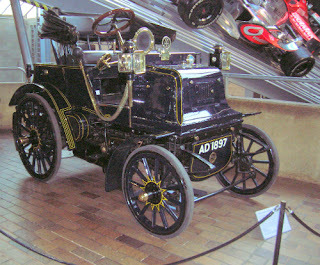 Here’s an 1896 Pennington Autocar, also from the National Motor Museum. Designed by American Edward Joel Pennington (quite the scoundrel if you can believe the Wikipedia article on him), this is the only remaining example. Seems he took orders for the car, but never delivered. 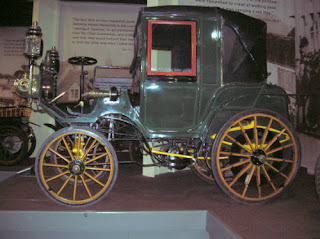 More 1800s cars to come in my next post.